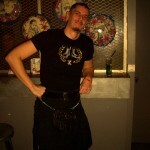 The Krash celebrated St Andrew (Scotland’s national holiday) in organizing a Celtic Night! Many guys in kilts were present and warmed the chilly night of November 30. In partnership with Mr B!